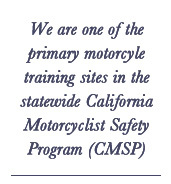 The best way to start is the California Motorcyclist Safety Program's (CMSP) Motorcyclist Training Course (MTC). Upon successful completion, you'll will receive a DL389 certificate waives the riding skills test requirement at the DMV. Those under 21 years old must take this course to obtain their motorcycle license. MTC teaches fundamental skills required to operate a motorcycle, along with street skills and strategies to stay safe. A multi-day, 15.5 hour course. Though designed for new riders, any rider will benefit from this course. We provide motorcycles (or scooters), helmets and a variety of riding gear at no extra cost. Weekdays = $235 - 21 years old and over. $165 age 15 1/2 to 20 years. Saturday/Sunday (2 day class) = $250 - 21 years old and over. $180 age 15 1/2 to 20 years. Special - $200 with proof of Law Enforcement, Military, Forest Service, BLM, and Powersports Dealership Personnel. Call for details. Payment is due with your reservation and can be made with a credit card over the phone. We have a variety of class schedules. Click on Schedules for current options, or call us at 909 430-3000. Office hours are 8am - 5pm Monday through Friday, and 8am to 4pm weekends.